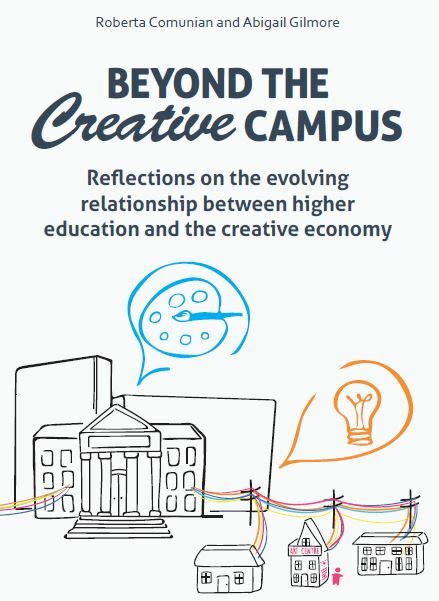 This booklet summarises and critically reflects on discussions and ideas emerging from a two year research network project funded by the Arts and Humanities Research Council (AHRC) in the UK (AH/J005800/1) entitled “Beyond the Campus: Connecting Knowledge and Creative Practice Communities Across Higher Education and the Creative Economy”. The research network was created to provide a platform for academics, practitioners, artists, cultural organisations, business development managers and other university directors, to exchange knowledge, make connections and discuss collaboration between higher education (HE) and the creative economy. © Authors: Roberta Comunian (King’s College London) and Abigail Gilmore (Manchester University).